On Tuesday, February 6, Maine State Rep. Heather Sirocki will host a public event to endorse a bill that would criminalize female genital mutilation (FGM) in the state. 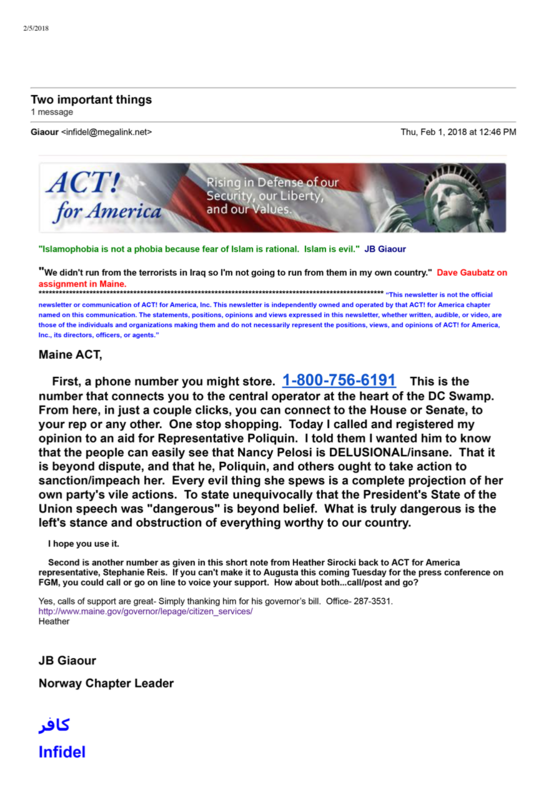 In her attempts to promote the bill, Sirocki has recruited the help of a local chapter of ACT for America, the largest anti-Muslim hate group in the United States. 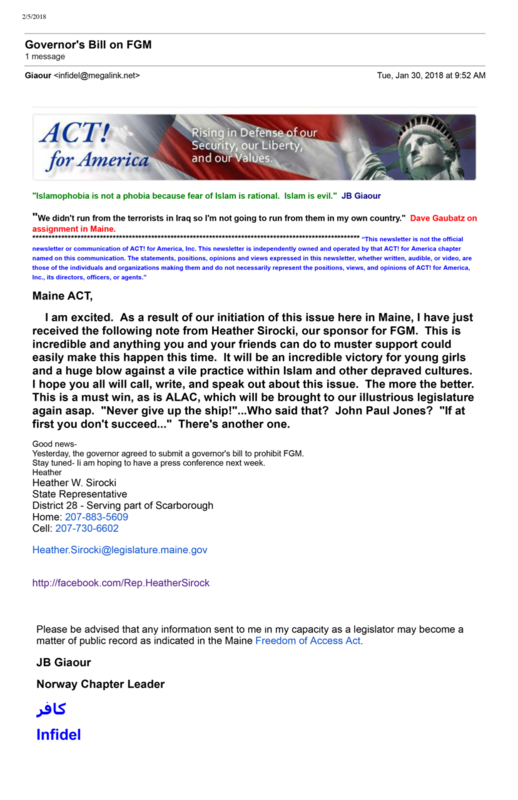 A series of emails obtained by the Southern Poverty Law Center document how Sirocki was not only in contact with the Norway, Maine, chapter of ACT for America, but also with ACT’s national office in an effort to garner support for her event, set to take place at the Hall of Flags at the capitol in Augusta. ACT works with elected officials to pass anti-Muslim legislation at the federal and state level. The organization is most known for promoting unnecessary and sometimes unconstitutional “anti-Sharia” legislation across the country. ACT also lists state FGM bills as part of its legislative agenda although the abhorrent practice is already outlawed at the federal level. A similar bill to criminalize FGM was introduced into the Maine legislature last year, but failed to pass. Jared’s response indicated that ACT for America national was providing a speaker for the event in Augusta and pleaded with activists to attend, writing, “This is our chance to make a showing in August that will make a difference.” The third and final email confirmed that Rep. Sirocki was indeed in conversation with ACT national encouraging ACT members to call the governors office in support of the bill. “Yes, calls of support are great,” said Sirocki. In 2015, Hirsi Ali spoke at ACT for America’s national conference. As part of its ongoing efforts to vilify Muslims and their faith, ACT and other anti-Muslim groups often try to paint the practice of FGM as being intrinsically part of Islam despite it being a cultural issue whose origins predate Islam and whose victims have included women of Christian, Jewish, Muslim, animist and other traditional religious backgrounds. Nevertheless voices from the anti-Muslim hate movement continue to push the false narrative that FGM is practice unique and intrinsic to Islam. Hatewatch spoke to Dr. Azizah al-Hibri, a published scholar of American and Islamic law and founder of KARAMAH: Muslim Women Lawyers for Human Rights, an advocacy organization dedicated to advancing the rights of Muslim women through Islamic and civil law. Al-Hibri expressed her skepticism of Maine’s FGM bill from a legal standpoint. Discussing the findings of forthcoming research on FGM to be presented at the United Nations, she noted, “part of it is just PR because the FGM issue has been unfortunately and unfairly connected to Islam, when in fact it is a cultural issue.